The mission of LWML is to assist each woman of The Lutheran Church—Missouri Synod in affirming her relationship with the triune God so that she is enabled to use her gifts in ministry to the people of the world. promote objects of the International LWML – mission education, mission inspiration, mission service and support mission projects. 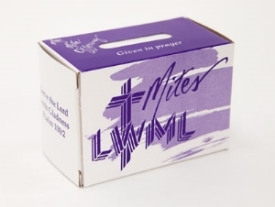 Based on the Biblical account of the widow’s mite (Luke 21:1-4), the mite box is intended for regular contributions of “mites” offerings above and beyond the support given to the congregation and Synod. Mite box offerings are used to support missions and ministry throughout the world. Place your Mite Box in a prominent place in your home, reminding you to contribute to it regularly. When your box is full bring it to church on any given Sunday and place it in the large Mite box on the wooden stand in the back of church right next to the ushers as they are giving out bulletins. A major mission project for our LWML is making tied quilts for Lutheran World Relief and for people and organizations in our community. We are always looking for women to help with the process, much of which can be done at home. Many women are involved in making the quilts. Some cut donated fabric into squares. Others sew squares together into tops. Still others work on preparing the backings for the quilts. Then we come together the 3rd Saturday of each month to tie the quilts together. The tied quilts are then taken home by various ladies and the edges are stitched by machine. Each November, after LWML Sunday, the quilts are delivered to LWR. To date we have donated 1000+ quilts!